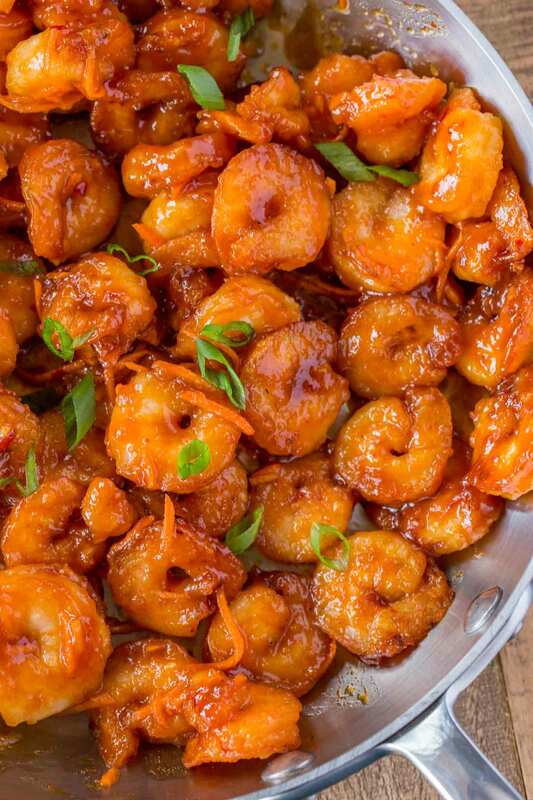 Skinny Chinese Orange Shrimp made with honey orange sauce that’s crispy and delicious with added carrots for crunch and flavor. Easy healthy Chinese food doesn’t have to be hard with recipes like this or Skinny Kung Pao Chicken or Beef and Broccoli. It’s also super quick since we don’t have to fry anything! If you hadn’t quite noticed yet we are HUGE fans of Chinese food around these parts. Being on a diet definitely doesn’t mean we can’t enjoy all the delicious flavors of takeout that we were used to, it just means more cooking at home! Since homemade food is always healthier and less expensive than takeout it’s kind of a win-win scenario. Plus, this dish is super easy to make, I promise. Is Chinese Orange Shrimp Healthy? YES, the only things to rein in is how much oil you’re using in the wok. 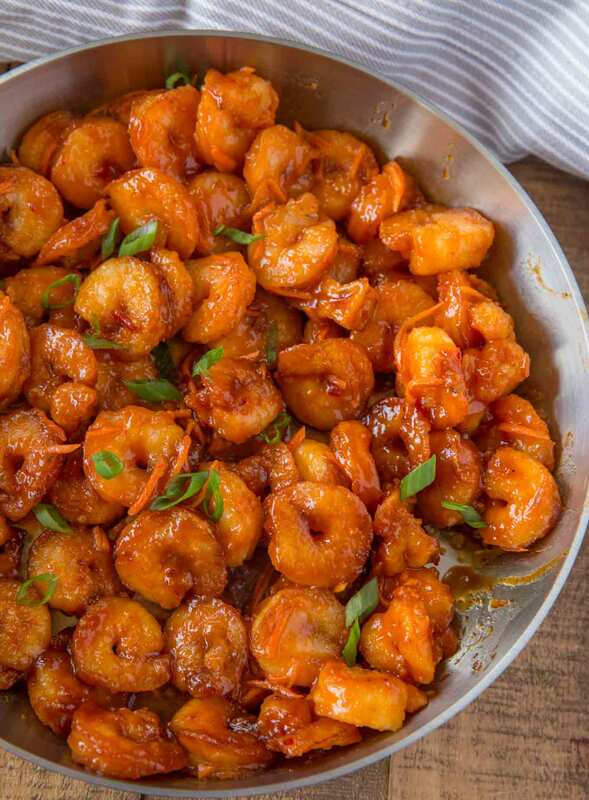 Keeping the oil to a minimum (since we’re not deep frying the shrimp as it is traditionally made) you can enjoy this dish as much as you’d like. With just a teaspoon of honey it isn’t too sweet and the orange is doing most of the heavy lifting. 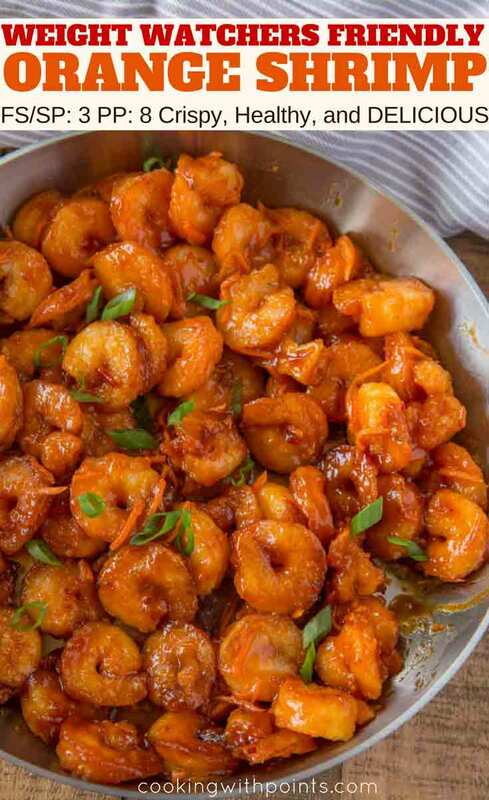 Even with the oil and honey and all, it still comes in at just 2 smart points for 6 ounces of shrimp! I may or may not have eaten a double serving of this over a giant plate of steamed broccoli and carrots. I’m not even sorry. Have all your ingredients prepared before heating up the wok. As the oil heats up in the pan you’re going to be adding in the garlic and ginger along with the orange sauce and other ingredients in rapid succession. Because shrimp cooks very quickly do not do any prep work while cooking. The entire dish is done cooking in less than 10 minutes. Serve it with your favorite chow mein recipe but sub in half zucchini noodles and use half the oil. Soup! Hot and Sour soup or even egg drop soup are great healthy options. Stainless Steel Skillet: Perfect for a quick stir fry or if you’d like to keep things more authentic, this wok is best. 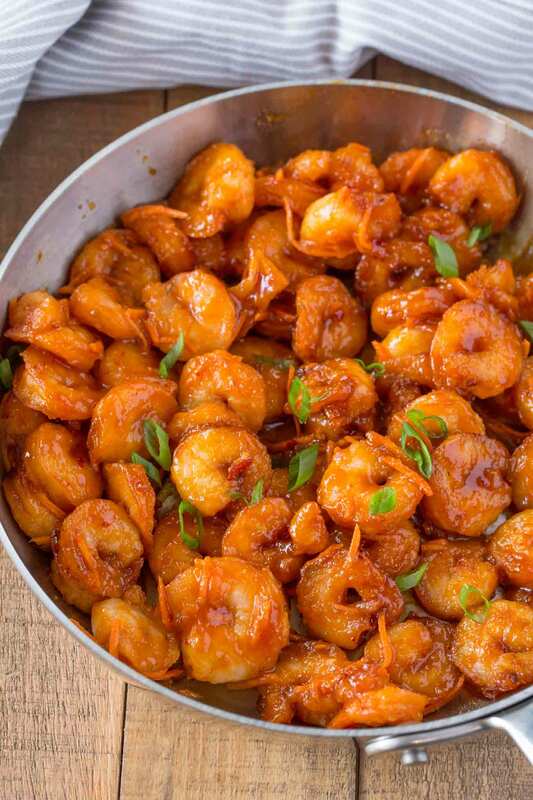 Skinny Chinese Orange Shrimp made with honey orange sauce that's crispy and delicious with added carrots for crunch and flavor. Add the orange zest, orange juice, soy sauce, honey and rice wine vinegar to a small bowl and whisk until combined. Add the garlic and ginger to the pan and cook for 30 seconds. Add the sauce back to the pan and add the shrimp and carrots on top. Serve immediately, garnish with green onions if desired. This is calling my husband’s name! I will have to make it for him! I can verify this recipe is a hit with husbands! I love how you break this all down so it’s fool proof not to mess up…..I need that kind of help, lol! Can’t wait to try it. It looks delicious! I love when I can enjoy Chinese at home! I LOVE this!! It’s fantastic!! A must make! Loving all of the fresh orange flavor in this! 🙂 Looks delicious. THANK YOU for all of your asian recipes. So far all I have tried have been amazing. Would love to see more Indian recipes also! Thanks for the feedback, Catherine! I’m definitely going to try and get some Indian food on here in the next couple of months! Sabrina, this looks Delish! However, I think the Count per lb on the Shrimp is wrong. The count of 13-15 is something I’ve never seen. The Shrimp in the Picture are Much Smaller! Please Advise, Thank You! I Love Your Site! Good eye, Tonja! I tested the recipe with 13-15 shrimp but my husband came home with the wrong size on the day I was shooting the recipe. I made this for our 5 grandkids over the weekend along with the healthy fried rice they were both hits. Absolutely no leftovers. So glad your family enjoyed it, Pam! My husband would love this…..Do you think it will taste the same using ground ginger in place of minced (fresh) ginger? If so what ratio should I use? Thank you. Yes, you can use ground ginger, use the same amount as you would fresh (2 tsp). I made this tonight and served it over mixed roasted veggies and a small amount of brown jasmine rice. The flavor was amazing- like Chinese take out, the sauce was thick- a big hit with the family and so quick to cook. Lauren, so glad your family enjoyed the recipe! It was a big hit with my family too! 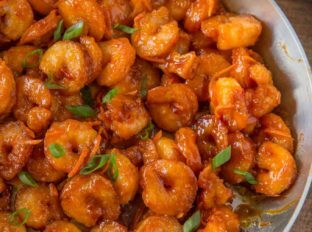 Could this same recipe be used with chicken instead of shrimp?